PID Control of a Process Variable Such as Pressure, Flow, Temperature, Liquid Level, etc.. 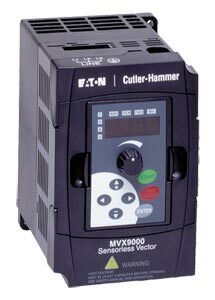 The Cutler-Hammer® MVX9000 Series sensorless vector adjustable frequency AC Drives from Eaton’s electrical business are designed to provide adjustable speed control of 3-phase motors. These microprocessor-based, sensorless vector drives have standard features that can be programmed to tailor the drive’s performance to suit a wide variety of application requirements. The MVX9000 sensorless vector series utilizes a 32-bit microprocessor and insulated gate bipolar transistor (IGBTs) which provides quiet motor operation, high motor efficiency and smooth low speed performance. The size and simplicity of the MVX9000 Series makes it ideal for hassle free installation where size is a primary concern. Models rated at 480V, 3-phase, 50/60 Hz are available in sizes ranging from 1 to 10 hp. Models rated at 240V, single- or 3-phase, 50/60 Hz are available in sizes ranging from 0.5 to 7½ hp. Models rated at 115V, single-phase, 50/60 Hz are available in the ¼ to 1 hp size range. The standard drive includes a digital display, operating and programming keys on a removable keypad. The display provides drive monitoring as well as adjustment and diagnostic information. The keys are utilized for digital adjustment and programming of the drive and for operator control. Separate terminal blocks for control and power wiring are provided for customer connections. Other features provided as standard include built-in DC braking, RS485 serial communications and PID control.